There is no doubt that the Netflix library count has declined in the United States over the past several years. It’s been reported that back in 2012, Netflix had approximately 11,000 unique titles in the US streaming library. But as content owners discovered just how valuable the streaming rights to their TV shows and movies were, many of our favorite titles were precipitously removed from the service. We recently collected data on the number of titles available in Netflix’ library by country and discovered that there are now only 5,600 titles available to US subscribers, a near 50% drop over the past five years. Until recently, the US Netflix library was the largest catalog in the world. Following the launch of Netflix in almost every country in January 2016, the US remained at the top of the list for nearly the past two years. But a new king of content now stands atop the list: Japan. We pulled numbers from Netflix catalog tracker uNoGS, and we found that Japan now tops the rankings with 6,340 titles available for streaming. Back when Netflix launched globally in 2015, the Japanese Netflix catalog only had around 2,000 titles, their current library now having tripled in size over just two years. 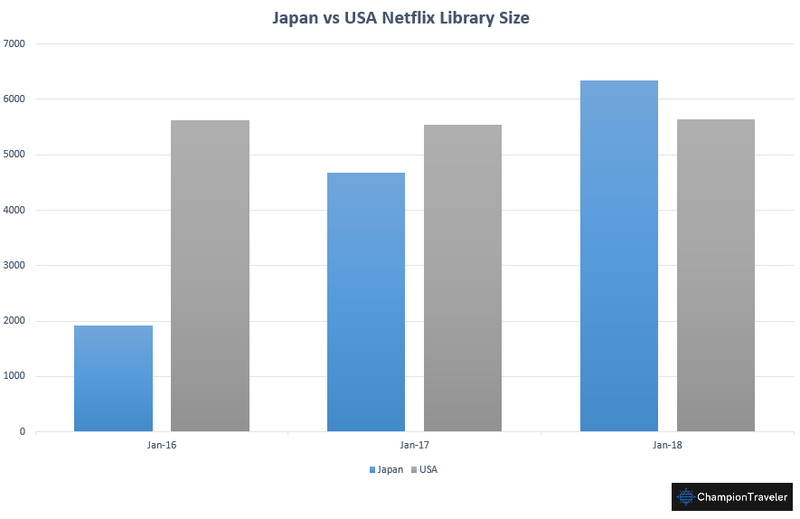 As you can see in the above graph, the US library has remained fairly flat over the past two years, and likely signifies the neutral location where Netflix hopes to hold the title count. Most other countries have been doubling and even tripling in their Netflix title counts, but with the exception of Japan, most are still below 5,500 while the US seems to be holding steadily. One thing of note, it is hard to quantify the subjective quality of any country’s Netflix catalog. The general sentiment we researched leads us to believe that the US library is still the most desired catalog, with the highest quality list of TV shows and movies. We spoke with a few Netflix subscribers in Japan who are friends of our site, and they let us know that while they are happy subscribers, there are a lot of titles in their Netflix catalog that they’re not interested in at all, and that a large percentage of it feels like filler content. However, some could likely make the same argument about the US Netflix library as well. While the title count has remained flat, the quality of the catalog has fallen a bit over the past two years. We are still happy subscribers, but the library does appear to be bleeding non Netflix Original content, with big losses in recent years, such as LOST, It’s Always Sunny in Philadelphia, How I Met Your Mother, and of course the always-missed King of the Hill. While many Netflix originals and new program acquisitions from international content creators have been rock-solid, for example Mindhunter, End of the F***ing World and Dark, three recent hits, US subscribers still miss several of the shows that have been removed due to irreconcilable differences between content owners and Netflix. So if you’re planning a trip to Tokyo anytime soon, know that you’ll have access to the biggest Netflix library in the world. Sorry Japan, but the Netflix DVD service in the U.S. has 100,000 titles. It’s still the biggest catalog. Uh, but who still has DVD service? super lame though — dvd service. Yah. That’s why they specified “in the US streaming library” grandpa. I knew there was another reason I wanted to stay in Japan. The U.S still has the best quality of shows over any of country. Quality over quantity.